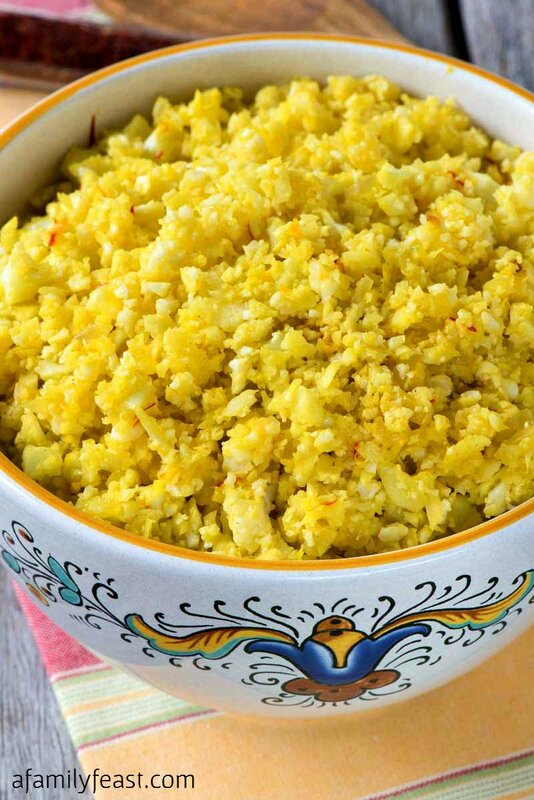 Saffron Cauliflower Rice is a low-carb, grain-free substitute for rice, and it’s also delicious and easy to prepare. This colorful side dish gets its glorious golden color from coconut milk infused with saffron – and both ingredients also give this Saffron Cauliflower Rice a wonderful flavor too. Saffron is a little pricey but a little bit goes a long way – so if you can afford to buy it, please do! The flavor is wonderful and unique. But if saffron is out of your budget – you can swap in some turmeric instead to give your cauliflower rice a similar, lovely golden color. This Saffron Cauliflower Rice cooks up in just minutes – and the most time consuming part of the recipe is “ricing” the cauliflower. You can buy store-bought “riced” cauliflower – but it’s just as easy to make it at home. If you have a food processor, simply cut your head of cauliflower into pieces (remove the core), then quickly pulse again and again in the food processor until your cauliflower is cut into small pieces. 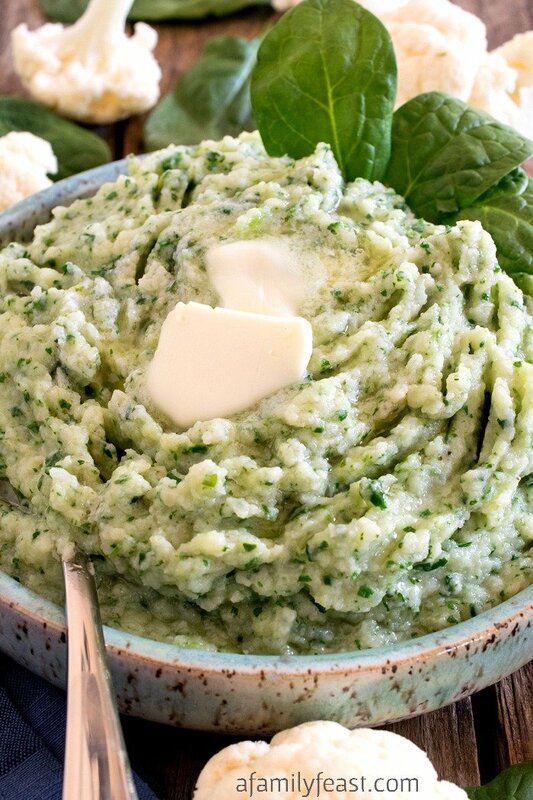 If you don’t own a food processor, simply use a box grater to grate the cauliflower into small pieces. No matter what technique you use – we think you’ll love this Saffron Cauliflower Rice! *Freeze leftover coconut milk in sealed zip-lock bags. Crush saffron threads in a mortar and pestle to break them up. They don’t need to be pulverized so small pieces left is fine. Heat coconut milk in microwave in a small bowl until hot. Scrape the crushed saffron into the coconut milk, making sure you use a small rubber spatula to get every bit. 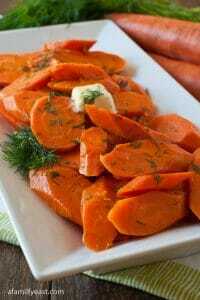 Let steep while you prepare the rest of the dish. Core the cauliflower and cut into florets, leaving some stem on each. Place in food processor with blade attached and process in 2-3 batches. Pulse a number of times until the pieces are rice sized. Pour out into a bowl and pick out any large pieces and place back in the food processor with the next batch of florets. Keep doing this until all of the large pieces are rice size. In a medium sauté pan or skillet over medium heat, add oil and once hot, add the onion. Sauté onion for about three minutes or until the pieces become translucent, about 3-4 minutes. Add the cauliflower and sauté just to heat and brown slightly, about 1-2 minutes. Add the saffron mixture, stir and serve. I have tried it and yes, it tastes awesome! Very tasty recipe with saffron and cauliflower!